I think the Oculus is a fail. It requires a very high end computer, is Windows-only and costs a fortune. And even if you had all that, it would be a bad experience in SL because of low FPS. I think it would be a good move for the Lab to instead push Cardboard. They could sell a special SL version even. How about a free Cardboard for every new Premium member? The Lab has never denied the use of the Oculus Rift on SL would not be optimal – as noted in the article 🙂 ). However, there has been a good deal of interest in supporting the headset, and this viewer is an attempt to meet that interest. Time will tell as to how well it fares, given not only the performance issues and the PC hardware costs, but the cost of the headset itself when it comes to purely casual use. In terms of supporting other VR options, that has not been ruled out, as Oz Linden noted during the recent Meet the Lindens session held with him and Landon Linden during SL13B. You can read his feedback on Second Life, Oculus Rift and possible support for other system here, and my full “highlights” of the discussion, with video, here). I wouldn’t say Oculus is a fail any more than SL itself based on PC requirements. I wouldn’t say Cardboard is a fail either although it is completely incompatible with every desktop, laptop, console, tablet and most models of mobiles. But it does work with what it works with, doesn’t it? I do like the idea of a free Cardboard for every Premium member – but will they also buy me a $600 phone and a $100/mo. data plan? HMD are no fail, the are great ! But Linden lab is throwing money and time away with investing in the oculus viewer. i btw cannot sue becuase i have htc vive. But Secondlife will never be on the specs to get a good experience in framerate etc. I still would look at some content in secondlife, most ins secondlfie is really not suitable for HMD, because quality. but i see content in Secondlife that so far i can see suite perfect in high fidelity and sansar. But I still think HMD with Secondlife is not a good idea at all, especially because high fidelity and sansar are coming. You KNOW how I’ve waited for this!! I’m just watching the Austrian GP and then I’m going to download it, wish me luck!!!! SHHHH!!! Don’t mention the Austrian GP… I won’t be watching it until this evening 🙂 . Hope you get a good experience with the viewer 🙂 . I tried the Linden labs Oculus Rift SL viewer on my CV1. I have a problem and just feel a little disappointed, This feels like a major step backwards from what i seen when it released support for the DK2. I don’t know if it’s just my computer, But every time I go to HMD mode it forces all the lowest settings. The UI during HMD mode is unusable as it’s glued on to the HMD while also being out of focus. The last DK2 viewer was pretty awesome, I don’t know what in the world happened here with this one. 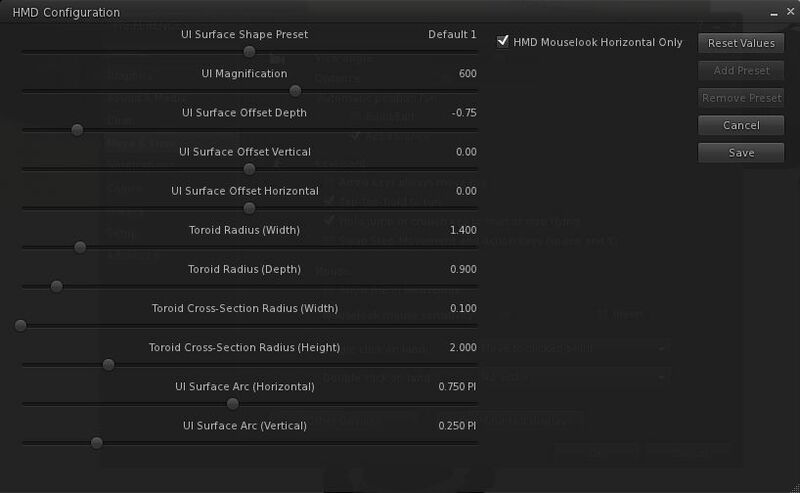 Here’s a image I uploaded showing the difference between normal viewer and HMD mode. If there are specific issues / problems you can point to (e.g. incorrect graphics settings, etc. ), do please raise a bug report with the Lab, if possible. While LL staff do read this blog, reporting specific issues through the JIRA is the best way to get them to take a look 🙂 . My setup is Windows 10, Xeon processor, 32GB memory and Nvidia GTX 980 GPU. All on latest drivers and updates from Nvidia, Oculus and Microsoft. This is very much a step backwards and I am not sure why. Really low quality visuals – jaggy edges on objects, etc. Using graphics sliders to go from basic through ultra settings appears to not affect this. Firstly I had to turn off “Atmospheric Shaders” or else VERY many things do not work. All objects with transparency or partial transparency simply were not rendered at all. Image in HMD is VERY bright and washed out pastel colours.. more so than the 2d monitor split view screen captures we are taking to illustrate the problems. Settings -> Move & View -> Head Mounted Displays settings appear all to have no effect. UI shows fixed in one place with little visible. On a small on screen windows its smack across the middle of the viewable area in HMD mode. With a larger screen before entering HMD mode it can be shifted upwards. No UI elements to lower or side parts are visible in HMD. Objects near periphery of vision disappear before they are out of HMD view. And sometime flash on an off very badly. Sea patches drop out and show as light blue squares in many contexts. There must be something fundamentally wrong… so I hope Linden Labs quickly find the root cause, as there is no doubt that the earlier versions were much better. windows 10, gtx 980 ti. lastest drivers. 32 gb ddr4 memory, i7 6700k processor. omfg. same problem. after waiting for cv1 support I was very sad that these issues came up for my system. I have found all the above to be the case – but what bothers me the most is that it is not fundamentally rendering VR since it is not displaying in 3D at all! There is no depth at all – which makes split-screen pointless to begin with. I’m not just saying that the depth rendering is poor, I mean it is not rendering any depth whatsoever. If you have your doubts – try it out – put it in HMD Mode and go somewhere you know would have easy-to-perceive depth. Close one eye – then switch to the other eye. No difference. You are viewing a giant 2D wall. You can already do that with any number of VR desktop viewers and have all of your UI controls right where they should be – and it will render according to all your graphical preferences. So, essentially, LL has reinvented the wheel and made it triangular. Try again. The giant 2D screen wall is what appears in the HMD when you are NOT in HMD Mode. Possibly only after you have been in HMD mode once (to sync properly with Oculus Home and to allow you to accept the warning screen via gaze). For me its definitely showing in 3D properly and head tracking, etc for both the DK2 and CV1 in my tests. The head tracking is working fairly well, actually. I get a nice motion with 3rd person view and a perfect 360 in mouselook. I do wonder, however, what the differences are between our viewers. When I am not in HMD mode my headset displays nothing. If I have not yet enabled in in the viewer it stays on the Oculus “grey room” until I first activate HMD mode. Once I have done that I get no stereo visuals at all. If I then disable HMD mode in the viewer the headset freezes whatever I was last looking at until I re-enable HMD mode where it will then resume in non-stereo on the headset. All a rather moot point, however, as the viewer has been all but officially killed-off by LL now. I think that actually might be a good thing, though – as I hope it works as a call-to-arms for any third-party wiz-kids who want to make a crack at a nice viewer we can all use with our shiny VR toys – Rift, Vive, Cardboard or whatever we want to plug into. In release notes for Oculus Rift Viewer.. the mention of being able to set low persistence mode is now not present. It was in the previous viewer. I tried the Advanced Mode HMD turned on and that did not bring back this setting either. I am also not sure what the Advanced Mode does. The release notes should indicate that. In HMD mode, no labels show over pose balls in the HMD itself or in the 2d Monitor split screen, etc. and when objects are selected (using the 3D screen as mouse cursor does not show in HMD at all) and an action like “Sit Here” is selected thing don’t work. Testing with CV1 shows more problems, as well as those previously reported. Note that Atmospheric Shaders has to be turned off to be able to display any items with any transparency in it. But on CV1, the UI layer is shown in the wrong eyes, they are reversed, so the UI elements look terrible unless you close one eye. Still no cursor icon is visible as in the DK2, and also most graphics settings and all HMD UI settings seems to have no effect, even after relog. with the various screenshots that illustrate the issues. Thanks for mentioning the JIRA here, Ai. I loved the old Project Oculus Viewer (version 3.7) with the DK2, I think it worked very well on sims that perform smoothly. The experience with version 4.1 now has been very disapointing for me, as for many others. I hope Linden Lab will fix it soon. When in HMD mode, the viewer maintains the two view split screen 2D monitor mirror of older Oculus Rift setups. Oculus SDK 1.3 provides a single more usable screen which is more helpful when some interaction with the 2D view, chat tools and when interacting via the mouse or keyboard as is necessary in Second Life.